Line the cups of four temp-tations® 6 cup muffin pans with paper liners. Prepare and bake cake mix according to package directions for cupcakes. Generously spread frosting over cooled cupcakes as desired. Dip the top of each cupcake in coarse sugar; gently shake off excess sugar. 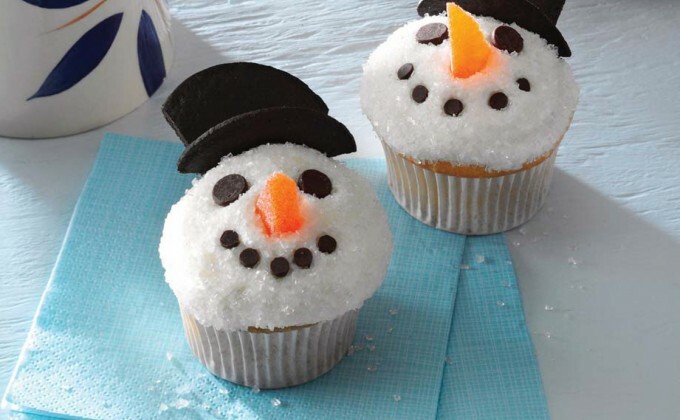 Add chips and mini chips to each cupcake to form eyes and mouth. Cut a small piece of an orange candy slice to form the nose. For the hat, microwave chocolate wafers for a few seconds to slightly soften as needed. Use a serrated knife to cut two narrow strips from opposite sides of each wafer. (Large center piece will form crown of hat; one strip will form the brim. Stick brim of hat, rounded side up, into top of cupcake; insert hat crown into the top edge. Secure with additional frosting.